Biscuits and dominoes are both highly favored for constructing furniture. While dominoes are stronger overall, a wood biscuit cutter tends to be cheaper and provide enough strength for most woodworking projects. 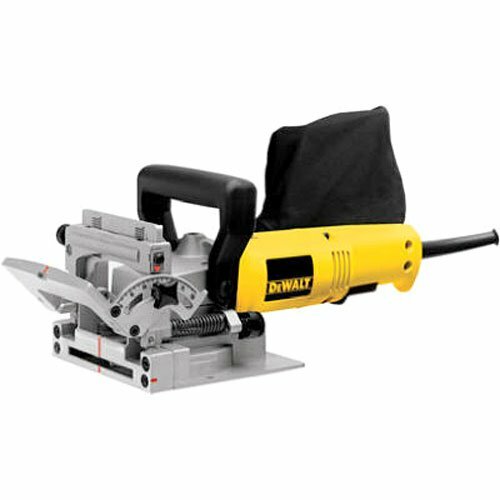 The best biscuit joiner not only takes into account power, durability, and design, but it must also be a good value. You can’t go wrong with any of the following tools for both biscuit and domino work. 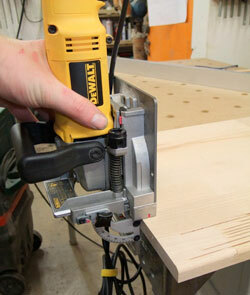 DeWalt has a reputation for top-quality tools, and this plate joiner is no exception. Durable and easy to use, the 6.5 Amp, 10,000 rpm motor can handle both soft and hard woods with little or no effort. The fence is a single piece, allowing adjustments up to 90 degrees, and flush cuts can be made with the guard still in place. Customers love the ergonomic design and affordable price of this plate cutter. The ability to switch between biscuit sizes quickly and clamp the joiner when doing stationary work adds even more appeal. Another common praise from users is how quickly they can perform an accurate cut with very little effort. Finally, the price is much lower than other models of similar quality, making this a favorite of users working on a tighter budget. One complaint about the DW682K is the issue of clogging when cutting certain woods, such as oak, too fast. The passage to the dust bag may be kept from clogging simply by cutting these hard woods slower. The other common complaint is that while the tool is easy to use, it can take a bit of time to learn if you aren’t familiar with biscuit cutters. A number of videos on YouTube (here’s a good one) and other online tutorials make this a much simpler process, as does practicing on scraps while you learn the basics. 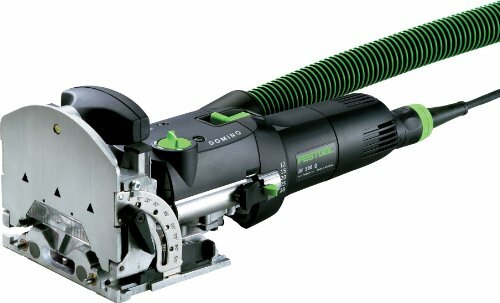 Festool is a company that has a reputation for quality tools that last. This DF 500-Plus combination set puts the competition to shame with easy alignment, a 90-degree pivoting fence with positive stops at 2.5, 45, and 67.5 degrees. It is specially designed to create a perfect cut every time, and its indexing pins help to get an ideal initial alignment. Finally, the joiner removes dust from the cutting area as you go, making it easier to get a solid adhesion during assembly. Users rave about the quality and speed the DF 500 lends to projects. They note that the joiner takes far less time than many other models and is so accurate that even dry-fit dominoes are difficult to remove. The durability of the joiner means long-term savings on repairs or replacements, and it easily connects to your shop vacuum for efficient dust removal. Finally, owners of this product note how easy it is to adjust the cutting depth to accommodate any of five different domino sizes. The deciding factor for many consumers when choosing between a biscuit joiner and domino joiner is the price. Unfortunately, the Festool DF 500 Q is a prime example of this dilemma, with a hefty price tag that prevents it from being the best on this list. Those who do purchase this or other Festool products note that the purchase is a long-term investment that pays for itself. However, many potential users have cited the cost as their one reason for avoiding this product. 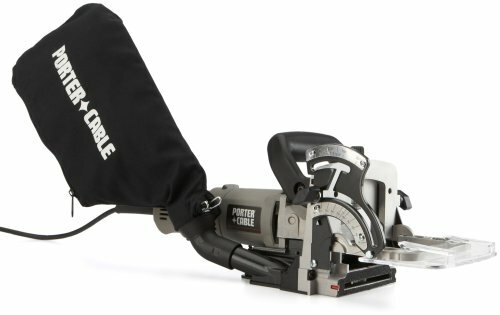 With a 7-Amp, 120-volt motor capable of rotating the blade at 10,000 rpm, the 557 by Porter-Cable is an excellent addition to any workshop. This biscuit cutter tool features a fence capable at tilting up to 135 degrees with a positive adjustable stop located at 90 degrees, seven cutting settings to handle a variety of woods, and four-inch blade with the option of using a two-inch blade for smaller cuts. As a kit, this set also includes a centering plate, spanner wrench, chip deflector, and dust bag. The relatively low price tag and highly-adjustable design have been popular highlights among consumers. Users frequently comment on how easy the Porter-Cable is to use. They also appreciate the extras included in this kit, although many prefer to connect the joiner to their shop vacuum instead of using the dust bag to avoid the occasional need to empty the bag out during long projects. While this product has been noted for very high quality construction in past, some recent users have complained that the fence pivots are made of plastic and prone to problems. These problems range from alignment issues to breakage. Other consumers have commented that the hex bolt used to keep the blade in place is so tight that it tends to strip when attempting to change blades. This may be remedied by using a wrench to loosed the underlying washer first, but the manual and other documentation fails to point this out. Finally, some owners of this product have complained that Porter-Cable blades are of lower quality than other brands and have chosen to replace then with blades by DeWalt or Mikita.